Parents will have to provide proof of vaccination when they enroll their children in nursery or preschool. In this respect, the Italian policy follows the example of vaccination policies in the US. But there’s one crucial difference: the Italian law doesn’t allow parents to opt out on the grounds of “conscientious objection”. Unvaccinated school-age children, up to 16 years old, will still be able to enrol in school – but their parents will be fined. The fines range from €500 to €7,500 (£436 to £6,540). I would argue that these measures are ethically justified, and other countries should follow Italy’s lead. Undoubtedly, such measures are coercive. Most parents, even if they are opposed to vaccines, will have no choice but to vaccinate their children. But the fact that the new legislation is coercive does not make it ethically impermissible. In fact, it can be argued that many laws are coercive but nonetheless considered ethically acceptable by most people. To remain in the context of public health, isolation and quarantine are two examples of coercive measures that are sometimes used in public health emergencies. Most people would think that, in many cases, it is acceptable to quarantine or isolate people in order to protect the community from infectious diseases. Appeals to individual liberty cannot outweigh the importance of protecting public health. Similarly, the risk of future outbreaks of infectious diseases that pose a risk to the life or the health of other people is a sufficiently strong reason to limit parents’ freedom of choice regarding whether or not to vaccinate their children. There are two types of ethical justifications for mandatory vaccination. First, most of us would agree that people have a moral duty not to harm or risk harming other people – at least when avoiding harm, or risk of harm, comes at a small cost to individuals. Unvaccinated children do represent a risk to other people, and vaccination entails a very small cost to parents and to children. The benefits of vaccination in terms of protection from infectious disease outweigh the costs and risks of vaccination. For instance, the World Health Organisation estimates that between 2000 and 2015, measles vaccination prevented more than 20m deaths. Concerns about vaccine safety are one of the most often cited reasons for opposing child vaccination. In fact, the most common side effect of vaccines – such as redness or swelling around the injection side – are very mild and soon disappear. The most serious side effects, such as anaphylactic reactions, happen in less than one in a million vaccinated people. On the other hand, if we consider, for instance, measles, two out of every 1,000 children who get measles will die from it. One in every 1,000 will develop encephalitis, which can leave the child deaf or intellectually disabled. And one in every 20 will get pneumonia. The costs and risks of vaccines are vastly outweighed by the costs and risks of a serious infectious disease such as measles. So harming or risking harm to other people when the cost of avoiding it is so small, is unethical. 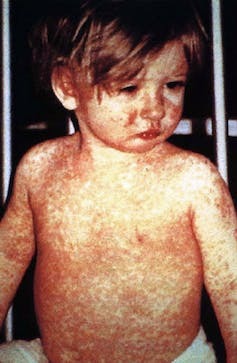 In particular, every child who is not vaccinated represents a risk for those who cannot be vaccinated for medical reasons (such as those who are allergic to vaccines or have a suppressed immune system) and for those for whom vaccination turns out to be ineffective (for instance, the whooping cough vaccine is only 70-85% effective). The second reason why mandatory vaccination is justified is based on the fundamental principle of fairness. On the basis of this principle, everybody should make their fair contribution to important an public good – that is, something from which everybody benefits. One such public good is herd immunity. We have herd immunity when a sufficiently large percentage of the population (typically between 90 and 95%) is vaccinated against a certain disease and the disease is therefore very unlikely to spread. So people who are not vaccinated, or for whom vaccines are ineffective, will be protected as long as the number of unvaccinated people remains below the critical threshold. Unless there are medical reasons for not vaccinating one’s children (for example in case of allergies to certain vaccines), refusing vaccination while enjoying the benefits of protection that is guaranteed by others’ contributions to herd immunity is unfair. If herd immunity is a public good that benefits everyone, everyone has a moral duty – based on a principle of fairness – to contribute to it. So mandatory vaccination policies, such as the one recently introduced in Italy, would guarantee that everybody make their fair contribution to an important public good such as herd immunity.